It’s that time again, when Neverwinter celebrates another year of not being razed to the ground by rampaging orcs, torched by marauding dragons, or devoured by hungry demons! In celebration of this year’s Jubilee, Lord Neverember seeks to refill his coffers after months of austerity by slashing trade tariffs to encourage visiting traders. As a result, traders from far and wide are making their way to the city to ply their wares. Of course, the Sword Coast is a dangerous place, and these traders need the help of brave adventurers to make it safely to Neverwinter. Blacklake, Ebon Downs, and Whispering Caverns are rumored to be pretty dangerous. Look for some to also attempt deliveries to your Stronghold if you’re in a guild. 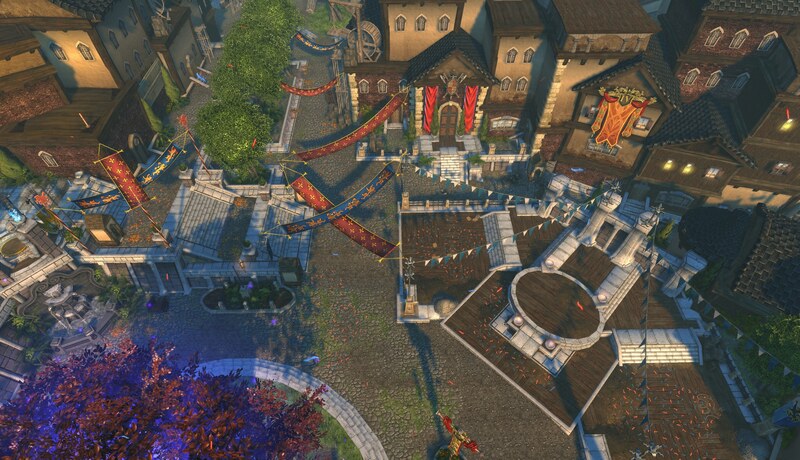 The Protector’s Jubilee is Neverwinter’s big anniversary event, when the city is decked in bunting and confetti floats on the breeze. The game is now four years old, and it’s time to celebrate! In addition to our week of bonuses and freebies, Protector's Enclave will be decorated with celebratory banners while performers juggle and breathe fire on the city streets. 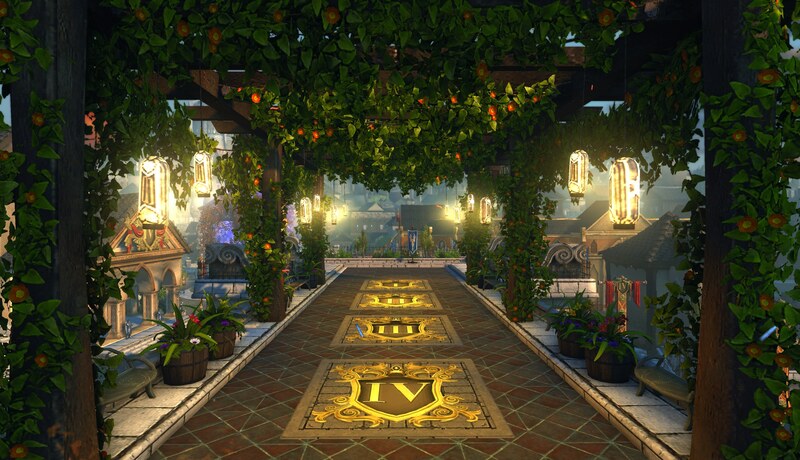 The doors to the richly decorated Protector's Garden will open to all visitors during the event, but after the festivities, only those who have redeemed a Garden Key may enter. Elminster’s Messages – As part of Elminster Aumar’s visit to Protector’s Enclave, he is seeking the help of adventurers to deliver grim tidings to the Harper agents scattered across the Sword Coast. Players will travel to various zones to accomplish missions, speaking to Harpers in the field. Players of at least level 6 will have a chance to receive two random quests based on their level. Completing the quest will grant you Protector’s Figurines that can be used to redeem Jubilee items in the event store. Protector’s Speech Skirmish – Lord Neverember has taken this time of celebration to address the people of the city, but unsavory elements want to do anything they can to disrupt the speech. It is up to you to help prevent these creatures from disrupting this joyous occasion. The Protector’s Speech is a scaling skirmish event that takes place in Protector’s Enclave. Each run, three randomized encounters will attack different parts of the city, and adventurers will have to defend the city and defeat the creatures. 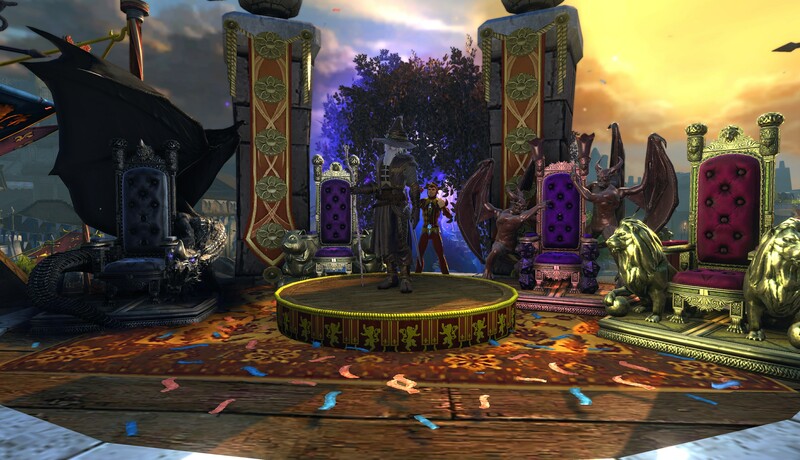 Defeat the hordes and you will be rewarded with many items including Neverwinter Renown. Taking part in the event earns players the Protector’s Bounty—packs of items including Protector’s Figurines, Renown, and more. Players can also share gifts with one another by raising a toast to Neverember’s generosity in the form of the Protector’s Hospitality. The more of each item players use, the better the rewards become. Players can earn temporary discounts in other stores, novelty items, and much more, all free while the event is running! 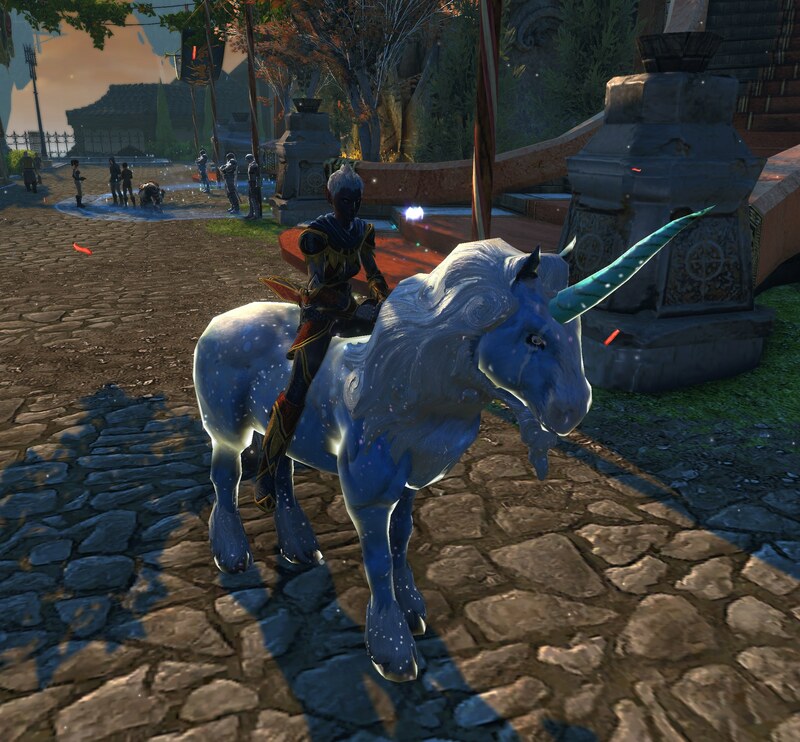 Jubilee Unicorn: This majestic creature has been adorned with bright hues to honors the services of the heroes of Neverwinter! Shadow Dragon Throne: One does not simply sit on a throne! 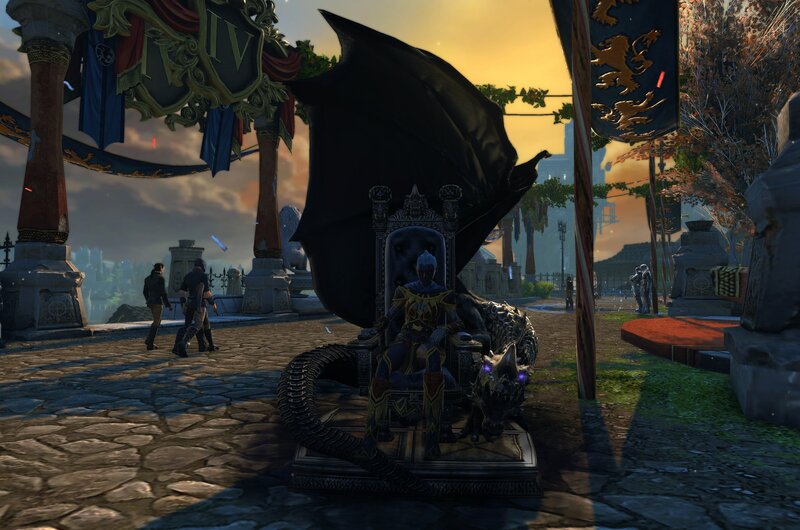 Intimidate those around you while relaxing in your new throne! Traveling Entertainer – Every now and then you need a bit of entertainment along your travels through the Forgotten Realms. The Traveling Entertainer is the perfect companion to lift your spirits and will also aid you in your battles with several fiery tricks. Ceremonial Armor and Cloak - This four-piece transmutable armor set was fashioned after the anniversary banners that are hung all around Protector’s Enclave. The transmute armor and cloak items are available for each class. Throne of the Lion - You may never be on a throne overseeing Protector’s Enclave, but you can always pretend to with this fancy item. Throne of Boo – A throne sculpted in honor of the unsung hero of the fight against Elemental Evil. 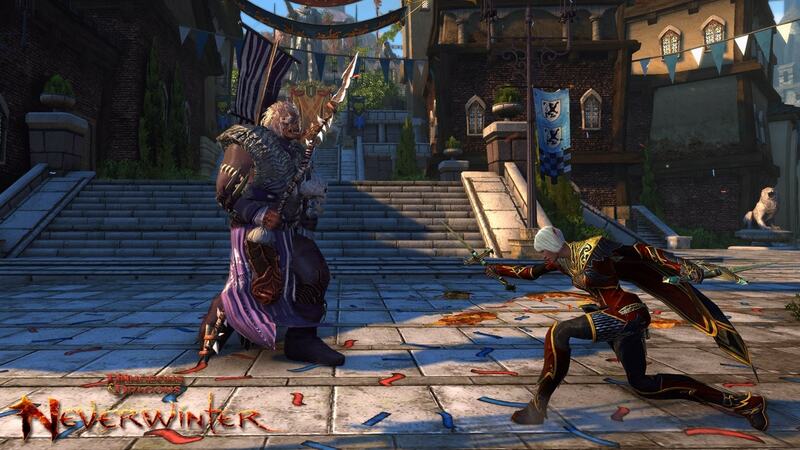 With your own golden hamster guardians at your side, you’ll be the envy of all in Neverwinter. Throne of the Gamemaster – This throne may not give you the powers of the great wizard Portobello DaVinci, but the gargoyle sculptures may serve as inspiration as you sit and ponder great adventures. Jubilee Parade Horse – Put yourself on a high horse with this decorated steed, which is trained to bear only the most noble of riders in majestic parades. Those who are privileged enough to ride this beauty will be rewarded with new, unique, and oh so fancy riding animations. Waterdhavian Fashion – Look your finest during Protector’s Jubilee with the Waterdhavian inspired fashion set that is famous for its dazzling and luxurious designs. This classy set is sought after by fashion enthusiasts along the Sword Coast to flaunt their rank amongst the other commoners that walk in the city. Fancy Cloaks – With these fancy cloaks, you’ll be the talk of the town as you ride gallantly to Lord Neverember’s rescue. Choose between the Cloak of the Waterdhavian Open Lords, the Ceremonial Cloak of Neverember, the Cloak of the Guardian of Neverwinter and the Lord Protector’s Ceremonial Cloak. NEW - Jubilee Celebratory Feast – Set up a great feast in the Great Hall and celebrate with your guild! Celebratory Confetti – A celebratory “popper” item that shoots confetti in all directions. There’s also a chance for an Ancient Curio to be left behind, which can be taken to the Disheveled Madman for a reward. Anniversary Ham – This slow cooked piece of ham increases maximum Block and Stamina for a half hour. Elminster’s Lunchbox – A reward pack that contains random food items from events, including the Anniversary Ham. Elminster’s Guide to Juggling – This item unlocks the “Juggle” emote. There are all kinds of free giveaways waiting for you as part of our four-year celebration of Neverwinter and more surprises around the corner! So join Lord Neverember, Elminster, and all your fellow adventurers in Protector’s Enclave when the festivities commence, and come and enjoy the fourth annual Protector’s Jubilee!